Photographed at Cave Creek Recreation Area, Maricopa Co., Arizona. Nov 23, 2008. 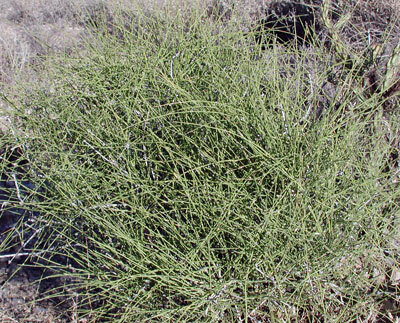 SHRUB: Essentially leafless shrub 1 m to rarely 2 m tall, with greenish twigs to conduct photosynthesis. Twig segments are straight and appear jointed together. The ends of twigs are not thorn like. Older branches' bark turns gray and fissured and the green twigs change to yellow. CONES: This is an ancient conifer with male and female cones produced on separate male and female plants. Male cones produce only pollen and the female cones one smooth seed. UNARMED. The twig are stiff, but not spinescent at tips. LEAVES: Two, narrowly triangular, 6 mm-long leaves are at each node. Eventually they whither and appear as scales. RANGE: Frequent throughout the Sonoran Desert in Arizona and Mexico at mid to upper elevations on rocky slope and high on wash banks. Ranges also from California to Texas. A mildly stimulating beverage can be made by seeping fresh growth in boiling hot water to make a tea. Ephedrin or analogs are present in the resulting tea.